A NEW RESEARCH FOR GARTNER, ANOTHER EXCELLENT RESULT FOR ORACLE! Market trends are clear, on-site software is losing its appeal while the cloud, thanks to its user-friendliness, is gaining ground very quickly. It is forecast that by 2020, 75% of large organizations will decide to take advantage of the cloud’s benefits to manage and analyze their financial performance, forecast and study the profitability of the various projects, favoring automation that will eventually replace multiple manual processes, thus improving its efficiency (also reducing time-to-value) and flexibility. This new research by Gartner, titled “Magic Quadrant for Cloud Strategic Corporate Performance Management Solutions”, could not but focus on the analysis of cloud-based strategic solution for business performance management. In order to determine the best suppliers currently on the market, they have identified some key attributes that cloud offered solutions should have, like, for example, the possibility to remotely manage the software application, to follow a pay-for-use model or to sign contracts that provide payment rates related to the actual use by the end customer, and the ability to exploit the public cloud and other shared resources. Oracle is positioned within the quadrant dedicated to market leaders and has this excellent result thanks to the presence of many factors such as its long experience as an on-site SCPM (Strategic Corporate Performance Management) software vendor, which has enabled it to reach a high level of global market penetration and its undisputed leadership in providing solutions for the management of some macro-areas belonging to business performance management (management reporting (EPRCS), reconciliation management (ARCS), financial consolidation). The Californian company then implemented new solutions entirely conceived for the cloud such as Oracle Planning and Budgeting Cloud Service (OBS), Oracle Profitability, Cost Management Cloud Service, and Oracle Enterprise Performance Reporting Cloud Service. Oracle has thus been able to evolve, keeping pace with market changes through a migration process that has seen the transposition into the cloud world of all the knowledge and skills gained over the years. 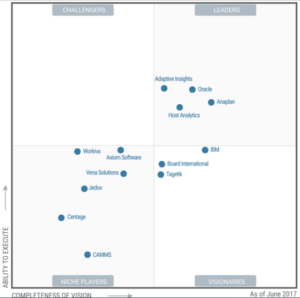 “Magic Quadrant for Cloud Strategic Corporate Performance Management Solutions”.